Hello 2017, goodbye 2016! The Dareboost team wishes you all the best for this new year: success in your business and projects with, naturally, highest web performance for your pages! More than ever, Dareboost is the ultimate tool to help you improving your websites speed and quality. Here is a 2016 retrospective of the major evolutions concerning our service: you may enjoy (re)discovering some of them! First, let’s have a look at a few 2016 achievements for Dareboost: More than 30.000 web professional are now using our service across 40 countries, and 300+ of them have subscribed to a pro plan. Among them : web development, marketing or SEO agencies, leading E-commerce companies (Carrefour, Flipkart,…), national & international media website (Arte, Daily News, Herold,…), corporate websites, and so on. We have just published a “References” page featuring a selection of companies that trust Dareboost to analyze and monitor their website speed and quality. I want to strongly recommend Dareboost and highlight why it has been so impactful and valuable for us at Flipkart. Very insightful analysis tool, invaluable Compare tool, Monitoring, extremely « manager-friendly » UI dashboard… Overall Dareboost has been an extremely resourceful and enlightening tool for us, especially given the scale that we operate at. From the very beginning of our project, it’s our mission to help you speeding up your websites, and we trust that in 2017 we will also speed up Dareboost growth! In order to properly support this development, our startup evolves too. Talking about the team first, that has just been reinforced with Philippe Guilbert arrival as our Marketing & Communications manager… Got a partnership idea? Do not wait any longer to get in touch with him! In 2017, Dareboost company will celebrate its third anniversary… Be sure that we already have a bunch of projects… But we’d rather keep the secret for the moment! Here is the only tip we can give you now: subscribing to our monthly newsletter – another new 2016 service – is the best way for you to be one of the first informed! Meanwhile, you won’t miss any of our last tips/best practices, studies and news about web performance. Now, for those of you who may have missed some of our latest updates, here is a flashback on the most important ones. A lot of new features and upgrades had been released on Dareboost in 2016. Hardly all of them had been detailed in this blog, so you might want to take a look at the entire list of our updates notes. Nevertheless, here is a selection of our major evolutions for the past months. Time to check if you didn’t miss anything! We’ve been working on it for months with some renowned customers: Dareboost now offers a synthetic user journey monitoring service to its customers! In a few words: all the power of Dareboost tool to monitor the web performance of a whole user journey… We can replay any user scenario of your choice. All you have to do is to detail us all the steps of your conversion funnels to monitor, and we’ll set it for you. Whatever is the technology or CMS of your website, no matter how complex the scenario may be, and still without anything to be installed! Interested by this brand-new tool? Do not hesitate to take a look at our detailed blog post about our user journey monitoring feature or ask for a demo at sales[AT]dareboost[DOT]com. Meanwhile, we haven’t forgot to boost our “classical” web performance monitoring features. Powerful enhancements had even been released all along 2016. As an example, last spring, we have introduced an amazing new way to organize and visualize your monitoring data : groups of monitored web pages. Thanks to this new feature, you can visualize the data from several monitored pages in a single graph, in order to detect (or compare) more easily overall trends. As one same monitored page can be added to several groups, this new feature can be used in many different ways. Take a look at this dedicated post including various interesting use cases. new data about the page weight and number of requests, now detailed by type of content (images, CSS, scripts,…). All your monitoring data can also be downloaded as a CSV file directly from your Dareboost dashboard! Finally, we have widened the available monitoring frequencies, our pro plans allow you to choose between daily and hourly monitoring… Higher frequencies are available on-demand, once again, feel free to get in touch at any time. 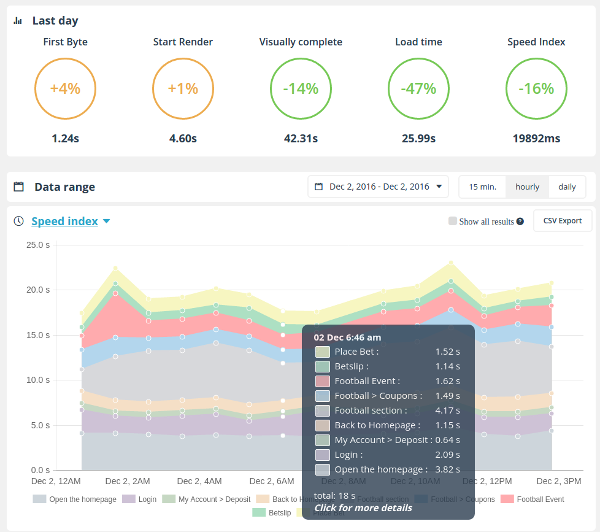 Concerning our website analysis and speed test tool, the major 2016 upgrade occurred last september with the release of a brand-new version of our testing probes technology. Including a lot of improvements as websockets support or a better latency and bandwidth management… But the real big thing has been the full HTTP/2 support. Meaning that Dareboost became one of the very first tool, worldwide, to take into account – within its automated optimization advice – this new protocol promised to replace HTTP/1. Thanks to this update of our technology, we have been able to launch another comparison tool that could be helpful for those needing to benchmark an HTTP/2 website : test and compare a web page loading via HTTP/1 or via HTTP/2. One last 2016 update we have got to remind you: new locations are available for our testing probes. Last june, we have announced a new probe in India (Chenai) and final tests for another one in China. That probe is now available in Shangaï, but only on-demand. Regarding all these major evolutions for Dareboost features, we have decided to update our pro plans as well. With one goal in mind: bring adapted solutions to all the professional of the web, as various as they can be (company size, type of activity,…). No more Start or Standard plans so… Here are our brand-new Freelance, Business and Enterprise plans. Still our “NEED MORE?” form allows to compose a plan fitting your very own needs! Do not hesitate to have a look to these new offers, or to ask us for any questions.